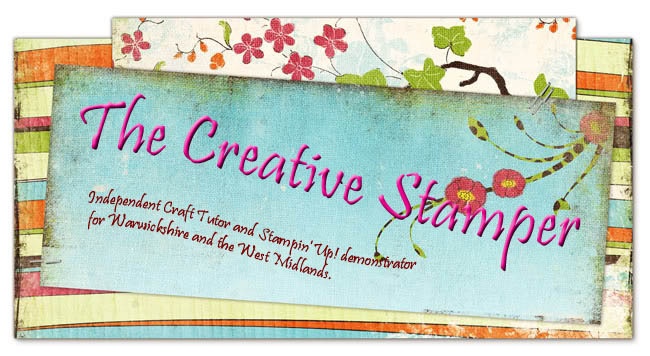 The Creative Stamper: Patterns and Pockets! Yes some more. Another card from a challenge elsewhere as well but still all Stamping Up. This time I used stamps from a wide range of sets which shows how easy it is to mix and match sets together as well as just using the one set. The sets used here were Cheers and Wishes for the Greetings, Year on Year for the Flowers on the front and seeing Spots for the Flower in the circle on the tabs. All stamped with Always Artichoke ink. The papers used were Autumn Flowers again very versatile as they are double sided and they all match with one another and the highlights were hand drawn. In fact only one sheet of paper was used for this card. Punches used were the corner punch and the scallop punch. 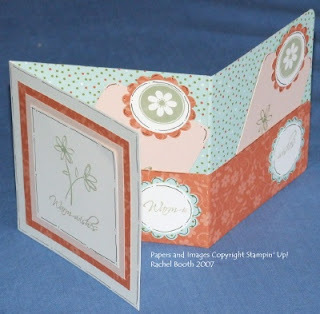 To create the card I used two white square blank cards and stuck two sides together. 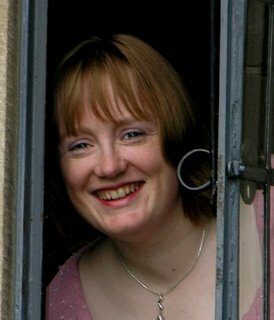 I then used a large piece of patterned paper to stick to two of the sides to form the inside and pockets - I just kept the paper deliberately long and folded it up to create the pocket. The scallops were punched from the patterned paper and then white circles punched from whisper white card. I stamped the circles afterwards which is why they are artily off centre (oooh but I now have a stampa-ma-jig and how did I live without it I want to know). The tages were cut from Blush Card and stamped with the flowers in always artichoke and the flowers added to the top as a tag pull. I just decorated my tags but you could stamp them with a greeting, message fun voucher or even add photos if you wanted. The front was simply stamped and mounted and highlights added in black pen - very straight forward. 2. Use your bone folder on creases to ensure a crisp finish. This design could so easily be used to scrap pictures for a special memory card for a special birthday and I think that could be a very special card that someone would love to keep and show others.